At Zion Hills Golf County – a villa & resort community built around an award winning golf course. The homes at Zion Hills redefine golf side living. Accented with free-flowing views of the golf course, the well-crafted homes are the crown jewels of Zion Hills. Homes range from lavish one and two bedroom condominiums that offer a lock & leave convenience to sprawling resort like mansions. A challenging, championship level 18 hole golf course designed by the legendary architect Ronald Fream forms the centrepiece at Zion Hills. Expansive granite shelves, rusty boulders and abundant lakes interweave with rolling greens to create a course that challenges experts and yet inspires learners, guaranteeing the mix of exhilaration and the indomitable spirit that makes golf such an addiction. Located just outside Bengaluru at Kolar, Zion Hills Golf County is the perfect getaway destination, whether it be for a corporate huddle or a family celebration or a personal vacation. There’s so much to discover at Zion Hills – starting with oneself, of course. Soak in the sunshine, breathe in the fresh air and relish the great outdoors, replete with BBQ pits, camping areas, nature trails. Take your pick from almost any sport to unwind with. And at the day’s end, the iconic club house offers the perfect setting to hang out and commune at or to simply gaze into starry oblivion. The golf fronting villa residences offer homely comforts to enjoy the golf vistas and enjoy the tranquility. Zion Hills is home to the prestigious Tarun Sardesai Golf Academy which already attracts serious golf aspirants from across India and beyond. The practice facility has three separate practice greens and natural grass hitting area of over 300 yards in length. The TSG Academy with its focus on producing world champions produced its first big success in Viraj Madappa, the youngest Indian ever to win an Asian Tour Golf Tournament. While still early days, Zion Hills has already won acclaim and recognition with a promise of more to come. 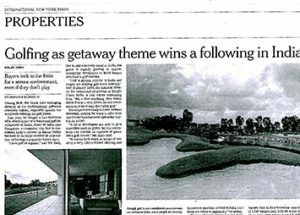 While happy home owners and delighted golfers are our greatest reward, the awards we’ve won for the Ronald Fream golf course or the Arun Nalapat designed golf academy are just a sign of things to come. Zion Hills is located near Kolar in a rapidly developing area. A sub 1 hour drive from the Eastern parts of Bengaluru, off the Old Madras Road, Zion Hills is connected vide one of the finest drives around Bengaluru. Bengaluru airport is a predictable 80 to 90 minute drive and Chennai is just three hours away. The new upcoming Bengaluru – Chennai Industrial Corridor will reduce the distance to Bengaluru by 20 Km and to Chennai by 60+ Km.